My name is Isaac Colby. I’m a member of Rise Above’s Teen Action Council from Colorado Springs. My experiences with friends, especially with those who engaged in the drug culture, have influenced my perspective on life and inform both my selection of and association with friends. Sadly, my experience with several good friends includes witnessing the effects of drug abuse – the loss of friends, family, and futures – first-hand. One particularly close childhood friend’s path to drug addiction began innocently with the use of ibuprofen for soreness after bike riding at the age of fourteen. He soon got to the point where he couldn’t make it through the day without his ibuprofen fix. A prescription for pain when he has his wisdom teeth removed led to a fixation on hydrocodone. Eventually, he even sold his bike to fund his drug addiction. As a consequence of his gradual descent into addiction to over-the-counter and prescription drugs, he forfeited his opportunity to become a professional BMX rider. Sadly, it wasn’t over yet. He began stealing from others, including my family. Once I became aware of his actions, I was powerless to help and I was left to watch from the sideline as he slid further into harder and harder drugs and an evermore reckless and selfish lifestyle. His reputation is now that of local dealer. Emanating out of his initial experience with ibuprofen, the lack of discovery by those who loved him, and the absence of treatment for his addiction is the forever altered landscape of youthful innocence. His personality and life is now drastically altered. My friend, who once had a bright future as a Pro-Biker, is now a misguided Pro-Peddler. As you’ll see from the list on the left, teens all across the state are engaged in this effort. And we’re making a difference. Now, 88% of Colorado teens would give a friend a hard time for trying someone else’s prescription drugs. As a result, prescription drug abuse among high school seniors dropped by 40% in two years. This is why I stand FOR friends and AGAINST drugs. P.S. You can join the effort like C.J. Anderson of our Broncos, who has proudly worn the Rise Above Colorado bracelet that I gave him. Every time he touches the ball I see that bracelet on his wrist and I think “if only... if only every teen out there knew what that bracelet represents”. Help us spread the word by making a gift today at https://www.riseaboveco.org/give.php. 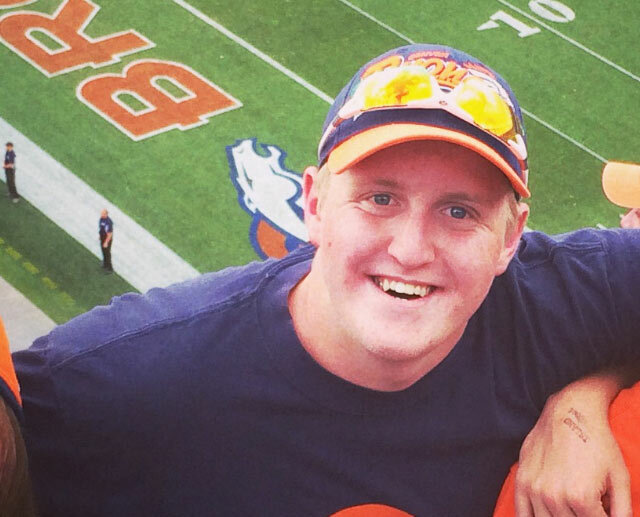 Isaac rises above by achieving the natural high going to Broncos games and riding his bike.